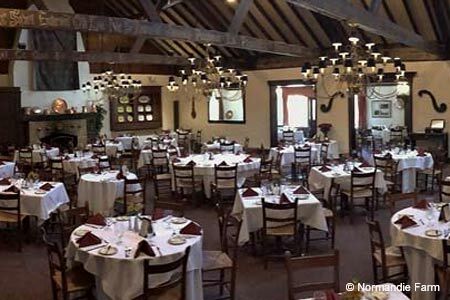 Outstanding French dishes and a sumptuous Sunday brunch designate Normandie Farm as a Washington landmark dining establishment. : One of Washington's landmark restaurants, the Normandie Farm has commanded respect and a devoted following who trek to Potomac for the farm's abundant French dishes and sumptuous Sunday brunch, a meal that converts dieters into hedonists. No wonder: The oversize popovers, puffed up like mini balloons, are a meal in themselves and have become a restaurant trademark. The lavish brunch buffet is loaded with everything from fresh oysters and stacks of smoked salmon to wheels of roast beef, lamb with tarragon, and wedges of Brie, hearts of palm salad and eggs Benedict. Owner/chef Cary G. Prokos rules a kitchen that turns out lobster bisque and homemade country pâté to begin a meal that might include duckling, calf's liver, tournedos or Châteaubriand. If price were never an option, this would become a weekly habit for many Washingtonians. A brief but distinctive wine list offers selections suitable to the elegant cuisine.